Throughout the same conversations, Assistant Professor of Mathematics and fellow trip leader Dr. Brad Schleben engaged students in his “Math of Social Justice” course, an opportunity for students to navigate their ability to question data while confronting the elements of power, privilege and interdependence seen in cross-cultural dynamics. Students had the opportunity to participate in active learning experiences including service projects, discussions with members of both the Quandamooka and Nyawaygi aboriginal communities and exposure to organizations pushing for social awareness and change – all from both a mathematical and human viewpoint. The group started their three weeks abroad in Brisbane and spent a few nights on North Stradbroke Island at a University of Queensland marine research facility where they learned about the ecology of local waterways and collected data on living systems. 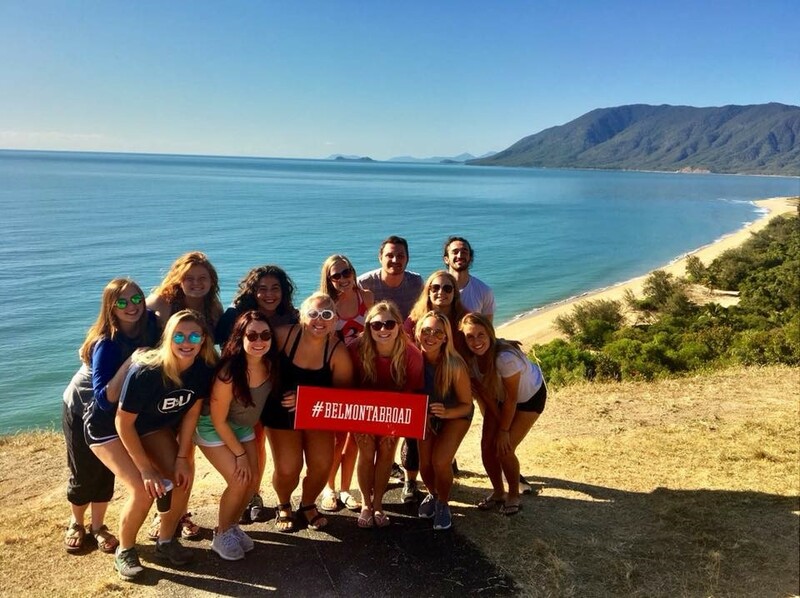 After travelling to Townsville to learn about the Great Barrier Reef Marine Park and its management processes, the group embarked on their first Reef EcoLogic Day on Magnetic Island where they discussed their responsibility on threats to the reef. Students had the opportunity for hands-on involvement as they pulled algae off rock and coral, quantifying both the plant mass and roots collected. Continuing north, the group went to Cairns via Mungulla Station, an experience dedicated to protecting wetlands from environmental threats, and planted trees as part of the group’s restoration project. Parker took a group of students to the area last summer for the same project and the team was able to see the progress a year of work has created. From there, the team spent a day on the reef experiencing the health and beauty of the open ocean. They also explored Daintree Rainforest and River before visiting Green Collar, an environmental data science firm that specializes in collecting, analyzing and modeling data to help agricultural enterprises and land owners maximize sustainable practices.